Excellent Weight-based Interface Chemistry Analysis System_USA KINO Industry Co., Ltd. Surface and interfacial tensiometer model A80 series, focusing on meeting demands of high-quality and high-precision in research and measurement of interface chemical analysis. It’s designed for measurement of surface tension (ST) / interface tension (IFT) , analysis of equilibrium and dynamic contact angle (CA / DCA) of solid material, contact angle of powder and fiber, as well as measurement of critical micelle concentration (CMC) of surfactant, Langmuir-Blodgett film and more, which are all characterizations of interface chemistry. It’s advanced among all of the equipment in the world with the highest update speed (92data/s) micro-analytical balance (0.01mg), precision vertical travel positioning stage controlled by stepping motor and digital temperature semiconductor sensor. The instrument advantages in such merits as simple operation, high precision and accuracy, higher data update speed, more sensitive reaction, more accurate positioning with resolution of 0.007μm and excellent quality. A80 is equipped with CAST®1.0 which represents world leading weight based interface chemistry analytical system. SM01, its main software module, adopts 4 kinds of different surface / interface tension measurement methods (3rd generation Young-Laplace equation correction based Wilhelmy plate method, DuNoüy ring method and classical Wilhelmy plate method) as well as powerful data management. It can be used for measurement of middle to high viscosity materials (-10000CP), equilibrium and dynamic surface / interface tension, surface tension of surfactant and its CMC. In addition, with software module SM02 - contact angle analytical system, it can also be used for measurement of Wilhelmy plate method based dynamic / static contact angle, contact angle of single fiber or fiber bundle, as well as modified, extended and wicking Washburn method based contact angle of powder, surface free energy of solid and its contributions (dispersive force, polar force, hydrogen bond value), density, sedimentation and penetration speed, tensile force of single fiber, size-distribution analytical by sedimentation, Langmuir-Blodgett film, analytical balance, thermal analytical balance, water absorption and more. Our international design, global sourcing and professional service provide you comprehensive, efficiency and professional solution in interface chemistry measurement, which represent the leading level of weight-based interface chemistry equipment. Development of printing plate detergent and its wettability analysis, wettability & printing analysis of film, paper, etc. The instrument has passed authentication by relevant authorities, strictly implementing relevant measurement standards. We are now pioneer enterprise in drafting integrated instrument measurement standards for interface chemistry analysis meters. 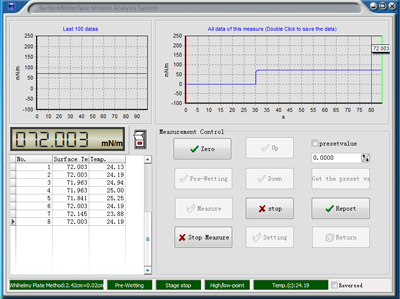 -More powerful functions of temperature drift correction, zero tracking, built-in weight self-calibration, etc. -upgradeable control software, customized to meet your special test requirements. - USA KINO is the only enterprise that has comprehensively studied and produced precision vertical travel positioning stage and applied it into interface chemistry analytical system. 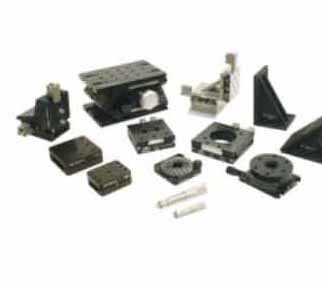 - We uniquely adopt coupler to connect motors and mechanical moving parts directly, which avoids problems of backlash and poor control accuracy caused by belt pulley connection structure. - The adoption of auto control of stepping motor and motion control card fully enhanced accuracy and compatibility of positioning control. - USA KINO adopts ionic wind technology to avoid detection error of liquid-gas interface caused by electrostatic. When there’s electrostatic existing, liquid interface will rise, sensing interface (plate or ring) will contact with it ahead of time, hence measurement value of surface tension will be larger than normal, for example, measured value is 71.214mN/m with electrostatic and 70.891mN/m when using antistatic kit. - What is more, ion beam kit module is provided for better anti-static experience. The anti-static device will be always on during measurement. It’s most effective in powder / fiber measurement to avoid powder electrostatic adsorption and deformation of single fiber. SM01 is designed for measurement of static / dynamic surface tension of liquid-gas/liquid-liquid interface with three methods (modified Wilhelmy plate method, DuNoüy ring method, classical Wilhelmy plate method). Lenard Frame ring method, Lamella breakpoint analytical module and interface elasticity analytical module are optional available. SM02 provides dynamic contact angle measurement by Wilhelmy plate method, contact angle measurement of single fiber by Wilhelmy plate method, modified Washburn method, extended Washburn method, thin-layer wicking Washburn method. It can be used for measurement of contact angle for plate, thin-layer, single fiber, fiber bundle, powder, as well as estimation of surface free energy of solid and its contributions like dispersive force, polar force, hydrogen bond value, estimation of adhesive work of solid and wettability analysis (wetting envelope) of solid. SM03 is designed for auto-controlling syringe pump for dosing, which can determinate critical micelle concentration with forward/reversed/extended mode, calculation of surface excess and Gibbs free adsorption energy. SM04 is designed for measurement of density of liquid / solid. SM06 is designed for size-distribution analysis for nano-particles. SM07 is equipped with all functions of analytical balance. - A variety of measurement methods available for you to make a comprehensive solution. 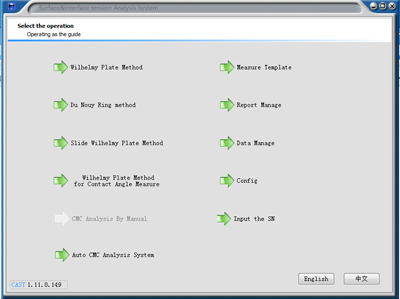 USA KINO exclusively provides Wilhelmy plate based Young-Laplace equation correction method, modified Wilhelmy plate method, classical Wilhelmy plate method, and DuNoüy ring method. 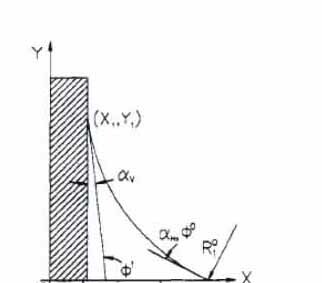 - World Leading 3rd generation Wilhelmy plate method based Young-Laplace equation correction method can be used to dynamically correct the influence of contact angle and buoyancy. Compared to zero buoyance method used by other companies, technologies from USA KINO can measure values of viscous samples and cationic surfactant; it can be applied more wide range and has higher precision. The function provides unparalleled convenience in measuring dynamic surface tension of time-dependent, medium-high viscosity sample, and volatile liquid or mixture. (2)CAST®1.0 saves all measured data of dynamic value automatically and exports them into Excel. (1)Measurement of surface tension and equilibrium surface tension as well as estimation of equilibrium time for surfactant. (2)Measurement of surface tension and equilibrium surface tension as well as estimation of equilibrium time for medium-high viscosity sample. 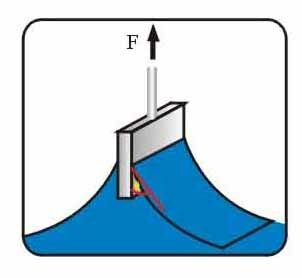 (4)Interface tension measurement, especially for plate-upward state in interface tension measurement. 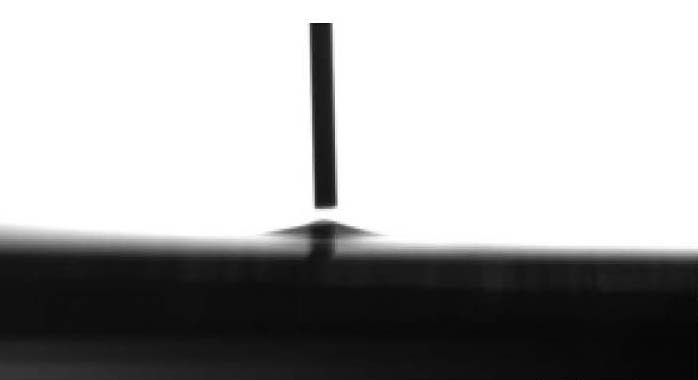 (5)Measurement of interface tension between monomolecular film and water, etc. - One-key zeroing and full-auto measurement with simple and convenient operation, minimizing errors caused by human operation. - Humanizing pre-wetting function, designed for oily sample test. 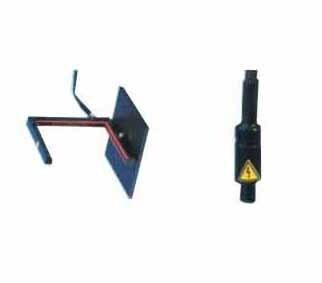 Series A80 are equipped with both build-in weighing calibration and self-calibration functions of sensing interface (Wilhelmy plate and DuNoüy ring), which is much better than other manufacturers’. It can enable you to control the reliability of measured value more effectively. Sensing interfaces confirm with international norms and standards, e.g. DuNoüy ring, Wilhelmy plate, Lenard frame ring and platinum cylinder, etc. It is uniquely designed for conditions of powder and single fiber, which can eliminate the effect of electrostatic with switch on. SM08 -LB film and interface rheology analytical module is optional available. Oscillation mode (interface rheological analysis) , expansion mode (analysis of dynamic surface / interface chemical phenomena). 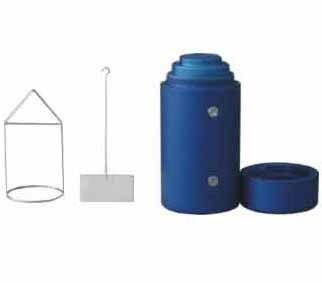 Kit for solid / liquid density measurement. 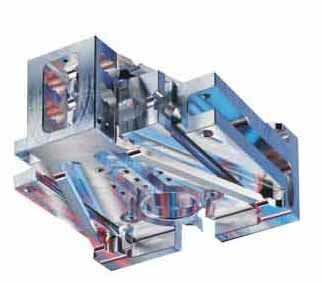 USA KINO provides various containers and holders for plate, single fiber and powder. 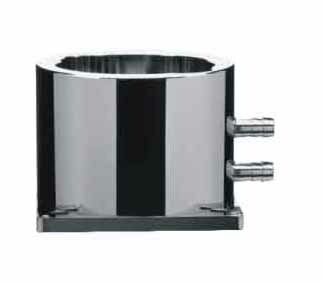 A804 has the same configuration with A801 except its extended function of powder contact angle measurement. A805 has the same configuration with A801 except its extended function of fiber contact angle measurement.